Borchert Field: Two Stories About the Milwaukee Journal's "Brownie"
Two Stories About the Milwaukee Journal's "Brownie"
Anyone who reads about the Milwaukee Brewers in the first two decades of the 20th Century will know the name "Brownie". Brownie was the Milwaukee Journal sports writer, covering baseball and other sports during this time. Brownie's real name was William Wallace Rowland. Born in Oshkosh, Wisconsin, in 1878, Rowland joined the Journal staff at the age of 12, as an office boy. He was known as "Wallie" around the office, but took the nickname Brownie as a young sports writer. Rowland remained with the Milwaukee Journal for 54 years, working as a reporter, sports editor, staff photographer, Green Sheet editor, city editor, assistant managing editor, automobile editor, and promotion editor. In 1936 he was elected to the board of directors and seven years later was elected a vice-president of the company. The story that interested me was published upon his death in 1944, by Journal writer Sam Levy. The first sports editor to accompany a baseball team to spring training and on road trips, Brownie liked to recalled the early days of his reportorial career. His closest friend in those days, more than 30 years ago, was L.M. Nahin, late business manager of the Brewers. One spring, when the Brewers trained at Cairo, Ill., the Ohio river went on a rampage. The club prepared to break camp and leave the flooded country. That day, Nahin received a telegram from Milwaukee notifying him of the death of Charles Havenor, president of the Brewers. Nahin did not have enough ready funds to move the club from Cairo and he had to hurry back to Milwaukee to make arrangements for Havenor's funeral. He left his friend Brownie in charge of the club. "Get the players out of here somehow," he told Brownie. Brownie, too, was low in funds. He took his large diamond ring, which was set in a Brownie setting, and pawned it. And he moved the Brewers out of town. Brownie trailed two Brewer pennant winning teams, the champions of 1913-14. He loved to reminisce about those days. One of his favorite stories was about his mother. The club left Milwaukee on a long road trip. It lost most of its early games. The players blamed their defeats to the absence of their lucky mascot. "You're the only one who can get our mascot to join us immediately and bring us luck again," the players told Brownie. The next morning the lucky mascot was back with the Brewers. She was Brownie's mother. She made the rest of the road trip and the boys won the pennant. I have done extensive research on the Brewers' 1912, 1913 and 1914 seasons, and have put together lengthy manuscripts on these years. Unfortunately, I did not run across these stories, but as we all know things can be missed while researching any subject. Both stories have enough truth to them to be taken with some value. That it rained heavily in Cairo, Illinois, can be verified from newspaper reports of spring 1912. And certainly club owner Charles Havenor passed away on April 3, 1912, while the Brewers were in Illinois. But the situation was a little more complicated. It had been raining for some days in Cairo and the Ohio River was rising to flood level. On April 1 the Brewer regulars traveled to Fulton, Kentucky, to play an exhibition game against the St. Louis Cardinals. Heavy rain forced the cancellation of the game before the end. 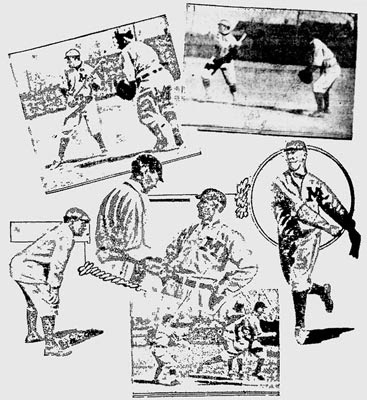 Top left, Chapelle at bat. Wingo, St. Louis, catching. Right, Gilhooley at bat. Schalk catching. Middle, Duffy coaching at third. Doc Marshall giving Anderson, Brewers' battery signals. Pitcher Anderson in action. Bottom, Charles scoring first run of game with Cardinals. The players remained in Fulton, while Manager Hugh Duffy traveled to Harrisburg, Illinois, to look for grounds. Duffy now had a problem. His regulars were in Fulton with business manager Louis Nahin, where flooding was getting worse. His back-up players and recruits were in the flooded city of Cairo. Duffy got his second squad out of Cairo, taking them to Danville, Illinois, a town much further north. The next evening the first squad arrived safely in Danville. Louis Nahin took the train home for the important matters back in Milwaukee. The Brewers practiced and played exhibition games in Danville, before opening the regular season in Toledo. Manager Hugh Duffy was with the team until a day before the season opened, when he traveled to St. Paul to attempt to pick up a player. The newspaper reports from Brownie back to Milwaukee during this period indicate he was with the team in Fulton and went to Harrisburg. Brownie then went to Danville. However, in one report (on April 3—the day Duffy got his second squad into Danville) Brownie said he had left Danville, but was not clear where he was traveling to. Thus, the story of Brownie moving the team out of Cairo could be true. He could have pawned his ring to get the back-up players and recruits out of Cairo to Danville. Or when he left Danville he could have traveled to Fulton and helped get the players out of that city, moving them to Danville. The story regarding Brownie's mother is not that hard to see as the truth. Players were (and still are) rather superstitious, and no doubt would see the luck in having a writer's mother with them if things had been going their way when she was there. The Brewers did have a mascot in these same years of 1913 and 1914, the goat named Fatima. The goat did not travel with the Brewers, so why not Brownie's mother? When this would have occurred during the 1913 or 1914 seasons, I have not been able to pinpoint. I have gone through my game by game win-loss records for both seasons and can find only one particular streak that would fit this description. The Brewers left on a road trip, and from July 29 to August 7, 1913 lost seven of the first nine games played. The team then won nine of the next ten games before returning home. However, there are three other road losing stretches that could fit into the description, depending how one cares to interpret what was written so many years later. Earlier in the 1913 season the Brewers went on a road trip and lost seven of the first nine games, but then had only one game left—which they won—before returning home. 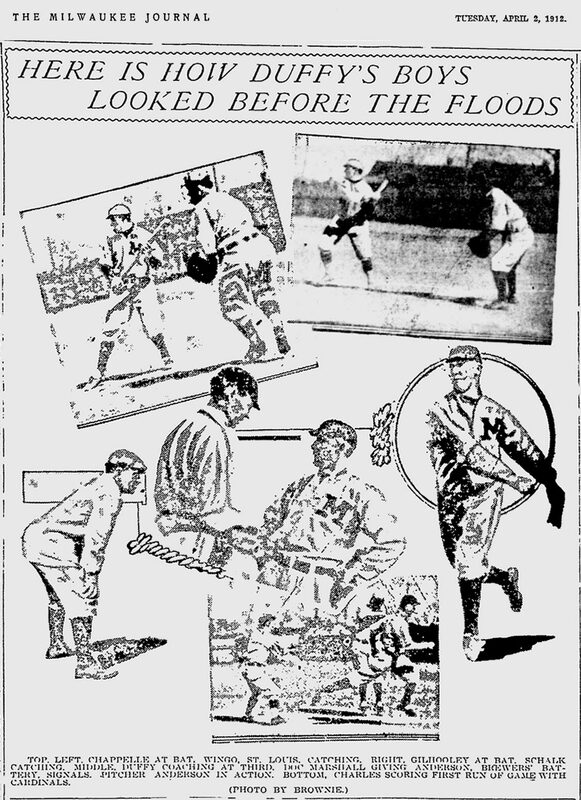 In July 1914 the Brewers lost seven in a row in Columbus and Cleveland. However, this was in the middle of a long road trip in which the club had won already won 8 of 12 games from Kansas City, Louisville and Indianapolis. After the losing streak the Brewers beat Cleveland twice before returning home. "Brownie" as sports editor in 1914, "his office papered with cartoons and calendars". In August 1914 the Brewers left town and lost three of five in Columbus, then split four games in Cleveland before losing all four in Indianapolis. The team then bounced back to finish the road trip winning three of four in Louisville. So, we cannot pinpoint this series. And maybe all the facts are not straight in the flood story. But aren't they good stories, even if the truth cannot be totally proven?